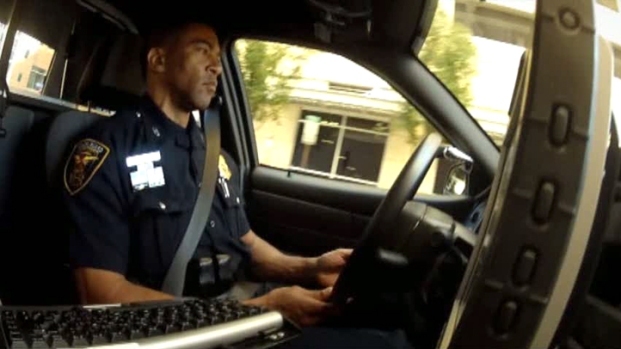 Fort Worth police plan to test a new device that could prevent crashes caused by officers typing on dashboard computers while driving. Over the last five months, the NBC 5 Investigates team has found dozens of those crashes involving Texas police officers distracted by their computers. The Fort Worth Police Department already has a tough new policy to deal with the issue. "They will not divert their attention directly to typing and getting more information while the vehicle is in motion," Chief Jeffrey Hallstead said. "We are mandating they do this when the vehicle is stopped." Fort Worth police have developed a distracted-driving policy that tells officers not to type on their dashboard-mounted computers while driving. Now, Fort Worth police tell NBC 5 Investigates that they plan to test a technology solution developed in Fort Wayne, Ind., where the police chief is already putting that new device in hundreds of police cruisers. "I felt we were really setting our officers up, putting all of this technology in a car and expecting them not to use that while they're moving -- basically texting and driving," Fort Wayne Police Chief Rusty York said. "We looked and really couldn't find any solutions that were available on the market." Fort Wayne police worked with a local company to develop and test a device called Archangel II. The software shuts down many of the computer's functions when the car accelerates past a certain speed, which is determined by the department. 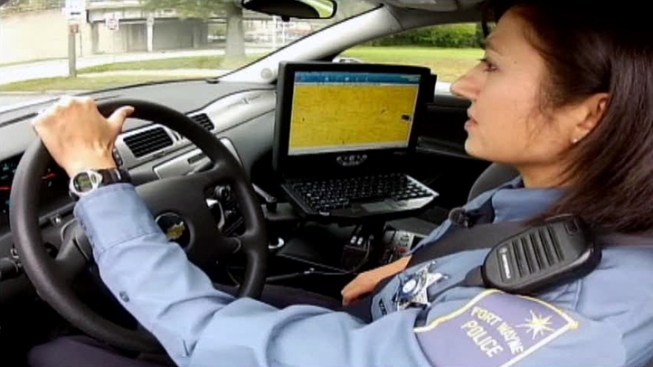 Fort Wayne officers such as Raquel Foster will still be able to see the GPS screen while driving, but to check incoming police calls or respond to messages she will have to pull over. "So now it's above 15 mph, so I can no longer engage the computer," Foster said. "I can't change the screen (BEEPS); it doesn't function. No one likes change. We like to have the information that we believe we need to do the work that we want to do, so we're just going to have to adjust. We're going to have to adapt." An open records request filed by NBC 5 Investigates has revealed even more crashes involving Arlington Police officers using dashboard mounted computers while driving. "It will be an adjustment, but it's something they'll get used to and it will be safer for them," York said. Foster said she has been in situations in which the new device would have helped her. "Have I had close calls? Yeah I have. I'd be lying if I said I didn't," she said. Soon, 360 Fort Wayne police cars will have Archangel II on board and the department is already getting calls from other agencies inquiring about the new device. "I think that there's going to be a real need for this, because hopefully departments won't wait until something really bad happens," Foster said. Fort Worth police plan to try the Archangel II to see if it's compatible with new computers they're purchasing. If it works, the police department said it will consider putting the device in all the department's police cars. Meanwhile, police in the Tarrant County suburb of Colleyville are reviewing their driving policy after an officer hit two pedestrians while driving distracted. The woman injured in the crash said she believes the incident was caused by an officer distracted by a computer. According to a police report, a Colleyville police cruiser crashed into Iryna and Oleh Krutko as they walked across the street in front of the police station on the night of Oct. 21. Iryna was bruised and briefly unconscious after the collision. "They had no place to go," said David Hart, Krutko's attorney. Iryna, 40, later told investigators she believed the officer was using her in-car computer at the time of the crash. "It appeared to her (Krutko) that Cpl. Chavez was looking at the computer when she left the driveway of the police department," the report said. "Obviously, the officers should be trained and supervised to not look at the computer when they're taking off at an intersection when they're supposed to be paying attention to where they're going," Hart said. The officer who hit Krutko resigned two days later. The city said the officer told her supervisors that she had a family emergency. Her resignation letter said she left due to "unforeseen circumstances." NBC 5 Investigates was unable to reach the officer for comment. NBC 5 Investigates has discovered that Colleyville Police Department policy does not prohibit officers from using computers while driving. "We do not have a specific policy related to the computers inside our police vehicles," city spokeswoman Mona Grandy said. "Obviously, when we have an accident -- any kind of accident -- we look at everything, every possible cause, and then go back and study our procedures." Investigators determined that a distraction in the police officer's car was a contributing factor to the crash that injured Krutko. But, the accident report also blames Krutko for failing to yield the right of way as a pedestrian. In a statement, the Colleyville police chief said Krutko was "culpable" because she was crossing a street wearing dark clothing. Her attorney pointed out that there are street lights at the intersection -- and you can clearly see the couple in the police video after the crash. The police department declined a request to be interviewed for this story.